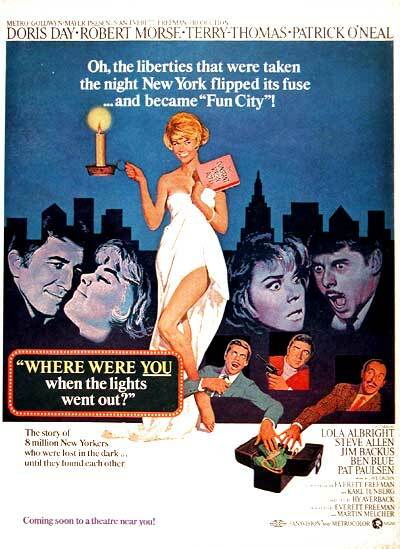 When the Great Northeast Blackout of 1965 hit, millions of people were left in the dark, including Waldo Zane played by Robert Morse, a New York executive in the process of stealing a fortune from his company, and two people whose paths he's destined to cross, Broadway actress Maggie Garrison and her husband, Peter, played by Doris and Patrick O’Neal. "November 9, 1965: Maggie Garrison (Doris Day) is a stage actress who has spent her career starring in virginal roles, although she would relish the opportunity to play someone less savory, such as an Italian prostitute, at least once before she retires. When a blackout shutters her current Broadway play for the night, she returns home unexpectedly and discovers her architect husband Peter (Patrick O'Neal) being overly attentive to attractive reporter Roberta Lane (Lola Albright). Infuriated, she heads to the couple's weekend house in Connecticut and takes a concoction to fall asleep. When corporate embezzler Waldo Zane (Robert Morse), fleeing New York with an attache case full of money, develops car trouble near Maggie's weekend house, he lets himself in and unwittingly takes some of the elixir himself, falling into a deep sleep beside her. Peter shows up, sees the two together and assumes his wife has been unfaithful. Despite their claims of innocence and ignorance, Peter believes neither of them and heads back to Manhattan. Maggie's agent Ladislaus Walichek (Terry-Thomas), anxious because she has announced her plan to retire, keeps her husband's jealousy burning in the hope their marriage will crumble and she'll be forced to continue working to support herself. Maggie and Peter eventually reconcile, but new questions about what really happened when the lights went out arise when she gives birth exactly nine months after that fateful night." Peter Garrison: Ten percent of Maggie is worth 100 percent of most women. Besides I knew her before she was a virgin. Maggie Garrison: Don't just stand there! She wants your hard boiled egg and her pickle! Peter Garrison: Where is he? Maggie Garrison: I don't have a boyfriend. "Doris Day's character in this film, an actress constantly being typecast as a virginal heroine, was meant to be a parody of Day's own squeaky-clean screen image." "Loosely based on the actual New York City blackout of November 1965." "When Margaret is sitting on the couch during her interview, the yellow cushions beside her keep on moving." "Morgan Freeman is seen briefly as a Grand Central Terminal commuter but does not receive on-screen credit." 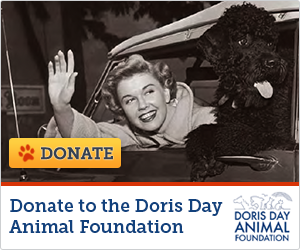 "The film was the fourteenth starring Doris Day to premiere at Radio City Music Hall in Manhattan."